The new Samsung Galaxy S7 will be hitting the market in March 2016. Here’s a look at what all features the new Samsung Galaxy S7 has in store and in what aspects is it different or better as compared to the already superb Galaxy S6 that launched last year. Here Samsung Galaxy S7 is compared to Samsung Galaxy S6 with full spec., side by side... No doubt Samsung Galaxy S7 is the superlative smartphone (perhaps LG G5 want to argue on this), but the question subjected that, is it really the best phone over the Samsung Galaxy S6? Is that better to stick with the previous S6 or to have the upgrade with the big price? What's the difference between the Galaxy S6 and S7? S7 is a worthy challenger for the excellent Galaxy S6? 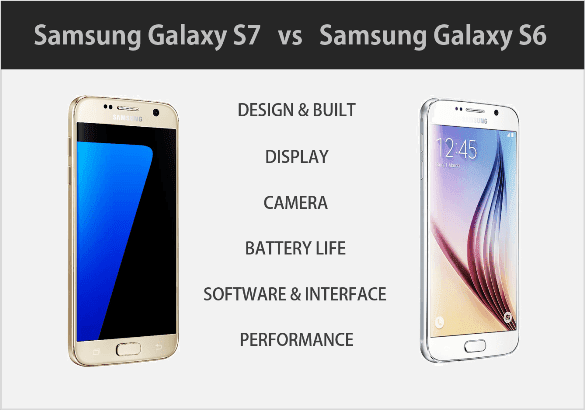 Have a look at the quick comparison between Samsung Galaxy S7 vs Samsung Galaxy S6 with key factors of design, built, display camera, battery life, operating system, and performance that helps to get answered for the Que. : Is it worth upgrading to the Samsung Galaxy S7? Previously Samsung Galaxy S III cell phone have made the huge impact on cell phone market. Reviews of the Samsung Galaxy s5 attracted people to look and buy Samsung phones. Smartphones compare with new devices opens the buyer's eye to make wise decisions. They got to know from who makes an Android phone to which spec suits best with their need. Last time we saw Which Mobile Operating systems have the great impact on MWC, and it still making the sound that Andriod smartphone is the only phone that people are eager to know and use. So have a look at reviews of Android phones shown below that describes in details mobile phone features which will make you think twice before buy or upgrade to S7. Samsung stunned everyone with the launch of the Galaxy S6 last year that came with radical design language which saw a huge departure from the previous styling. The S6 flaunted the truly premium metal and glass design by ditching the previous plastic construction which was largely criticized. However, the S6 did drop some very useful features as well, including the microSD card, removable battery and water resistance features. And these were largely missed by the users. All these features are back on the Galaxy S7 making things really better. When it comes to design, then the new Samsung Galaxy S7 is very much similar to the S6, seems a lit bit complex but have good improvements. 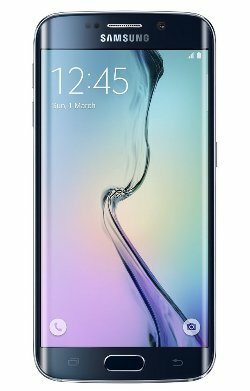 The S7 also gets a full glass and metal (aluminum) construction. The previous protruding camera sensor at the rear is missing on the S7 making it really sleek, more good looking and very workable even when lying on flat surfaces without rocking. Also, the flat rear panel of the S6 has been replaced with a subtly smooth curved edged back panel on the S7 akin to the Note 5. This enhances the mobile phone’s handling on the daily basis and feels great while holding onto the palm. The build quality of the S7 has also enhanced, and it feels really strong and premium quality from all angles. The Galaxy S6 also impressed with its QHD 2,560 x 1,440 pixel screen which is a very commendable display in the Android world. The Galaxy S7 5.1-inch QHD display seems to be quite the same but does again come with some subtle enhancements. 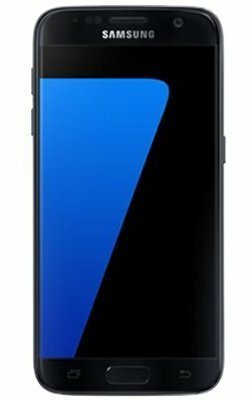 The Galaxy S7 gets an "Always On display" option that lets one always aware about the notifications and time without eating much of battery life as the AMOLED display allows some pixels to remain illuminated even when the handset it asleep. The Samsung Galaxy S6 offered an excellent camera which offers impressive pictures with its 16 MP rear shooter. The new Galaxy S7 comes with a downsized 12 MP primary camera at the rear. However, the S7’s new camera is the most powerful one that comes empowered with dual-pixel technology enabling it to soak in more light and offer clearer and more vibrant images even in low light conditions. It’s aperture f / 1.7 sensor is focused on great low light performance, while its autofocus also operates super fast providing superb photo shooting experience in all conditions. Samsung had gone ahead downsizing the battery capacity of its Galaxy series, and this meant that the Galaxy S6 and the Galaxy Note 5 came packed with smaller batteries last year as compared against their previous models. This move of Samsung was strongly criticized. The Korean mobile major knows how to please its customers by giving an ear to all the feedbacks. And thus, the new Galaxy S7 will be coming powered by the bigger than ever 3,000 mAh battery pack. Nevertheless, Samsung has not yet graduated to USB Type-C and so the S7 is still on microUSB. When the overall experience is considered, the new Galaxy S7 will be really offering the better package. It runs on the latest Android Marshmallow which comes with great enhancements when battery life is considered as compared against the previous Lollipop. Marshmallow along with the large battery pack, together will ensure better backup than the S6, which will also soon get upgraded to Marshmallow. S6’s fast charging and wireless charging features obviously get carried over to the S7 as well. The inclusion of the TouchWiz on the Galaxy S6 was also a great thing as it flaunts the most impressive version of the interface and offers a smooth experience. The S7 also gets an almost same version of the TouchWiz that is employed on the Galaxy S6 Edge+ and the Note 5. Although initially the Galaxy S7 will offer a better smartphone experience than the S6 once the S6 gets upgraded to Marshmallow, the functionalities, as well as the experience, are expected to be almost the same in both the models. In this department, we still have to wait to really ascertain the capabilities of the new Galaxy S7, as a thorough hands-on experience is needed to comment on the performance part. At the moment nothing is known about the S7’s performance apart from the fact that is gets powered by an impressive Snapdragon 820 processor, whereas the S6 comes equipped with an Exynos 7420 processor that is equivalent to the Snapdragon 810 chipset. Thus, some amount of improved performance is certainly in the store of the Galaxy S7. And that is why people love to use Samsung galaxy internet on the go without any lagging on rendering web pages. The latest generation processor along with an additional gigabyte of RAM at 4 GB as compared against the S6’s 3 GB RAM, the S7 is sure to be smoother as well as faster than the S6. Nevertheless, as Galaxy S6 is already a very impressive smartphone offering smooth experience, the difference might not be noticed by many users. The actual performance results of the S7 are still pending, though. To sum it all up, the new Samsung Galaxy S7 is just an even improved and more refined version of the S6 which was a radical change over its predecessor – the S5. The improvements on the S7 are small but impressive nonetheless. The changes on the S7, especially the ones on camera capabilities, battery capacity, microSD card slot, the water resistance, and even the removal of the rear camera bump are really helpful. And there’s also the design and built quality improvement. Nevertheless, all these small nice enhancements of the new Samsung Galaxy S7 will come with a considerable asking price, which might make many S6 owners think twice before upgrading, but upgrading from any earlier S series models to the S7 will be a real gain.